Getting sick is a part of life. It’s gotten us out of school, ruined plans for that big party, and kept us up in the middle of the night. In fact, most adults average two or three respiratory infections per year. But the fact remains: Sometimes you’ve got obligations that can’t wait. And if getting healthier in the New Year is one of those, it can feel like a big setback to be sidelined by a cold as soon as you’ve adopted your new health-focused groove. In general, if you’ve got a little cold, it’s best to scale back, decreasing both the intensity and duration of the workout, says Lipi Roy, M.D. But there are also instances when you should take time off completely. Here’s how to know the difference. Remember this easy rule: If your symptoms occur around your neck and above, it’s OK to do a light workout. If you’re sick below the neck, stay home. We’ll provide a few more details: If you have a common cold or mild upper respiratory symptoms—like a runny or stuffed-up nose—it’s generally all right to work out. 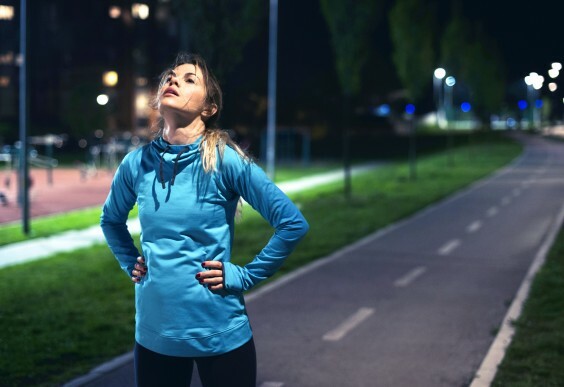 “In fact, there’s evidence that a light run followed by a lukewarm or hot shower may actually help clear congestion,” says Harry Pino, Ph.D., the senior exercise physiologist at NYU Sports Performance Center. There’s also one exception to our ‘above the neck’ rule: a fever. “If you’ve got a fever, avoid working out at all,” Roy says. Since a fever raises your body’s core temperature, and working out can also increase your body temperature, it’s not a good combination, Pino says. Plus, there’s the issue of dehydration. With the flu or a fever, it’s easy to get dehydrated—don’t make it worse by taxing your body with burpees or a spin class. Even after your fever has broken or you’ve recovered from a bad illness, Roy suggests avoiding workouts for the next 24 to 48 hours. And when you do get back into it, do not start with an intense workout—ramp up slowly, she says. Aside from being sick and working out, keep in mind that regular, moderate exercise can actually help improve your immune system—and therefore help prevent future illnesses.The key here is to keep it moderate and recreational. When you take it to the next level, things can get a little more complicated. “Any time that you are performing [athletically] at high levels, you compromise your immune system,” Pino says. Ever heard of the marathon sniffles? You run a marathon, and then you’re sick for the next week. That’s because when performing at high levels, or when you put extra stress on your body, your immune system is temporarily compromised. Think of it as too much of a good thing: Just the right amount of exercise gives you a boost, and an excessive amount of strenuous training can have the reverse effect. “If you’re not feeling well, this is Mother Nature saying, ‘Take it easy,’” Roy says. In other words, even if you’ve technically got the OK to hit the treadmill, you might end up recovering faster and simply feeling better if you take a day or two off to focus on drinking lots of fluids, eating healthy meals, and getting some extra sleep. “It’s really important to keep your immune system high to reduce your risk [of getting sick],” Roy says. And since stress, smoking, poor sleep, and nutrition can all contribute to a suppressed system, it’s a good idea to focus on building up before you start challenging your body with a new workout routine.